Every good chef must have a favorite lobster roll recipe. No longer a peanuts, popcorn and Cracker Jack menu, the Fenway Park food offerings in recent years have gone from hot dogs and beer to Sushi and Vodka drinks. Boston Mayor Thomas Menino while at Fenway recently dined on on a plate of shrimp, lobster, oysters, sushi, chicken and fruit. Fast catching up in popularity to the famous Fenway Frank, is the handmade Fenway Lobster Roll, Fenway chefs said. Made with fresh Maine Lobster, the lobster is cooked just prior to the start of each home game. According to Fenway Park Senior Executive Chef Ron Abell, they will sell about 1,000 pounds of lobster during a typical game. That’s a lot of cooked lobster meat for use in creating the lobster rolls. “This was a shocker, but it was one of the best lobster rolls that I’ve had … Every bite included a large chunk of lobster,” according to a GreatestLobsteroll.Com review. A visitor can spend $19 for a Fenway Lobster Roll in the expensive seats, or $13 on the concourse. Or you can follow the World Famous Fenway Lobster Roll recipe and make yours at home. While the recipe seems simple, there are some critical ingredients required to be able to reproduce the Fenway Lobster Roll at home. Abell starts with one fresh, hard shell, two-pound Maine lobster. A female lobster is preferred. He cautions that all ingredients should be added sparingly so as not to overpower the delicate flavor of the lobster and the toasted bun. Here are the directions and ingredients to makes two lobster rolls. Add the live lobster to a kettle of roiling salted water and boil for 12 minutes. 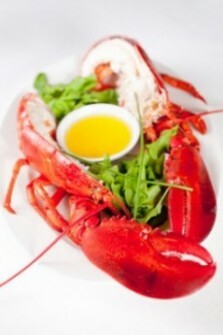 When cooked, remove the lobster and pierce the claws and tail shell with a large chef’s knife to allow water to drain. Pull the tail from the body. With the fingers on the underside of the tail shell, crack the shell, split it apart and remove the meat. Slice the back of the tail meat and remove the intestinal vein from the tail and discard. Remove any Roe (eggs) and set aside. Dunk the tail in cool water to wash.
Next, crack the claws and knuckles with the chef’s knife. Remove the meat. Chop the lobster meat into chunks and place in a mixing bowl. As an option, Roe may be added to softened butter and spread on roll.